It’s Mardi Gras! So I decided to do a Creole, Cajun dish to celebrate. Originally I wanted to make a Po Boy sandwich, because I am a big fan of the bread in a Po Boy. It’s the same bread in Banh Mi. And I did not want to do the normal Jambalaya or Gumbo. I make those too often. But there is one dish I have never made but love. 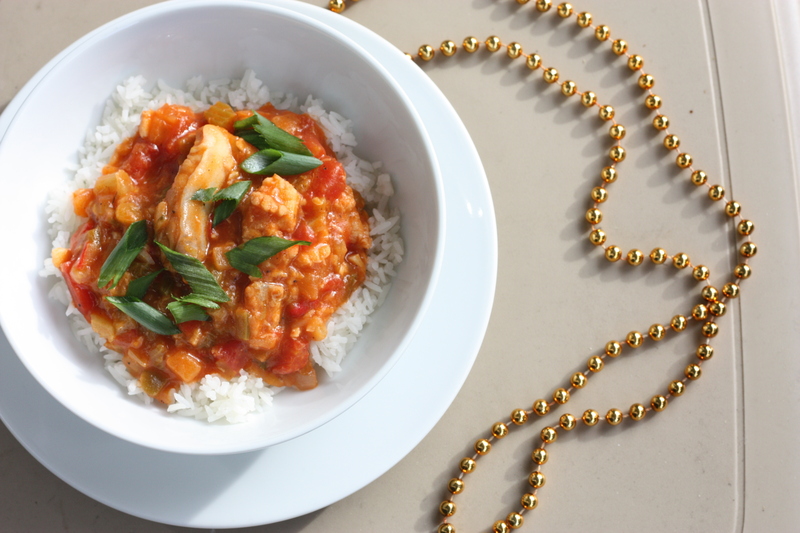 Etouffee is so simple and versatile; you can put anything in it. I’ve had shrimp and crawfish etouffee before and loved it. So I figured I would take a stab at it for Mardi Gras. In this Etouffee, I’m using chunks of catfish, because I had it on hand. To start, in a pot on medium low, throw in 1 part celery, 2 parts onions, 2 parts bell peppers and sweat them with butter in the pan for about 10 minutes. Then add the chunks of catfish and saute for another 3 minutes, adding butter as needed. Then add about a tablespoon of tomato paste and cook for half a minute, mixing everything together. The mixture should have a red hue now. Then add 2 parts diced tomatoes, 1 bayleaf, some chopped parsley, and 2 cloves of garlic. Cook this mixture down to get rid of most of the moisture, then add 2 tablespoons of flour, and cook the mixture until it has a light brown color. Then add in chicken stock to about the height of the mixture. Stir, cover, reduce for about 5 minutes on low heat. Then serve cover rice with some chopped green onions. There are other methods of doing it, but they are very time intensive. This way isn’t too bad, but it tastes pretty darn good. Enjoy your Fat Tuesday! This entry was posted on February 21, 2012 by rrfoods in Dinner, Fish and tagged cajun, catfish, etouffee, mardi gras, new orleans.